Victoriano Huerta overthrows Madero and assumes the presidency 1913–14. Founding of the National Revolutionary Party (PNR) 1929. 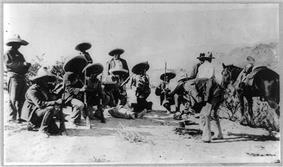 The Mexican Revolution (Spanish: Revolución mexicana) was a major armed struggle ca. 1910–20 that radically transformed Mexican politics and society. Although recent research has focused on local and regional aspects of the Revolution, it was a "genuinely national revolution." The failure of the 35-year long regime of Porfirio Díaz to find a managed solution to the presidential succession meant there was a political crisis among competing elites and the opportunity for agrarian insurrection. 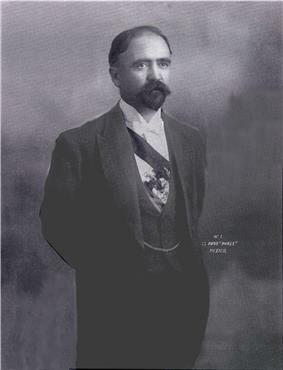 Francisco I. Madero, cheated out of the 1910 presidential election, revolted under the Plan of San Luis Potosí which declared the Díaz presidency illegitimate, named Madero as provisional president, called for democracy, and demanded the return of lands unjustly taken from Mexican villages. The armed conflict lasted for the better part of a decade, until around 1920, and had several distinct phases. The period 1920–1940 is often considered to be a phase of the Revolution during which power was consolidated and the revolutionary constitution of 1917 was implemented. Over time the Revolution changed from a revolt against the established order under Díaz to a multi-sided civil war in particular regions with frequently shifting power struggles among factions in the Mexican Revolution. The Constitutionalist faction of northern Mexico led by Venustiano Carranza were the victors in the military phase of the conflict. Northerner Pancho Villa joined the fight against Díaz and came to be a major military figure in the Mexican Revolution until 1915. 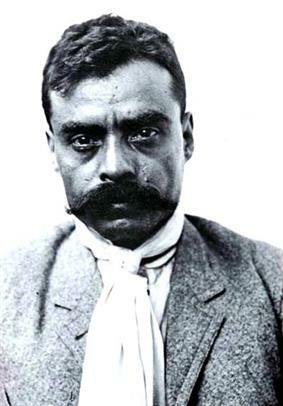 Peasant leader Emiliano Zapata opposed the Díaz regime and consistently led the fight for campesinos in the state of Morelos for land reform in Mexico until his assassination in 1919. The origins of the conflict were broadly based in opposition to the Díaz regime, with the 1910 election becoming the sparking point for the outbreak of a political rebellion. Elements of the Mexican elite hostile to Díaz, led by Madero, expanded to the middle class, the peasantry in some regions, and organized labor. In October 1911, Madero was overwhelmingly elected in a free and fair election. Opposition to the Madero regime increased from both the conservatives, who saw him as too weak and too liberal, and from former revolutionary fighters and the dispossessed, who saw him as too conservative. In February 1913 Madero was assassinated. Conservatives led by General Victoriano Huerta sought, from February 1913 on, to reimpose much of the old Porfirian order, but revolts against the regime ensued in the North, under the leadership of the governor of the state of Coahuila, Venustiano Carranza, and in Morelos by peasant leader Emiliano Zapata. Anti-Huerta forces were unified to oust the president. Huerta was forced to resign in July 1914 after 17 months. The Revolution had grown increasingly broad based, radical, and violent. 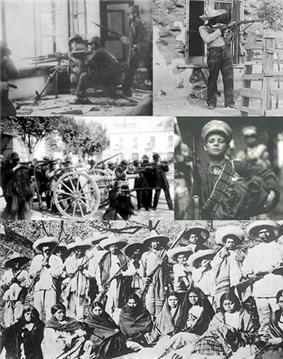 Many revolutionaries sought far-reaching social and economic reforms, restricting foreign investment and empowering Mexican workers and peasants via the state, while weakening conservative forces represented by the Roman Catholic Church in Mexico, wealthy landowners, and foreign capitalists. In 1914, when the winners of the anti-Huerta struggle attempted to sort out a new revolutionary order via the Convention of Aguascalientes, that solution failed. Former allies now fought each other in another round of bloody civil war. 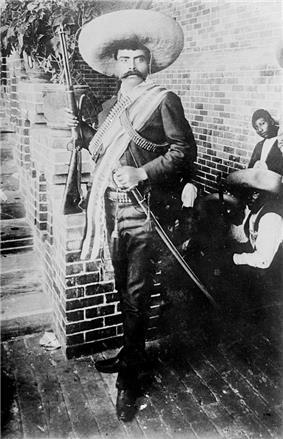 Carranza and the best general of the Constitutionalist Army fought against former Constitutionalist general Pancho Villa, who allied with Zapata. The outcome of that civil war between revolutionaries was not a foregone conclusion, but in 1915 Constitutionalist general Obregón defeated Villa and the Constitutionalists under Carranza consolidated power. Zapata withdrew to Morelos and his followers returned to guerrilla warfare; Zapata was assassinated in 1919. Following the Constitutionalists' military victory, Carranza became the pre-constitutional president of Mexico. Then with the writing and ratification of a new constitution in 1917, he was elected the constitutional president. In 1920 when elections were to be held, Carranza attempted to impose a civilian as the leading candidate for the presidency. Northern generals Obregón and Adolfo de la Huerta challenged the decision via the Plan of Agua Prieta. President Carranza attempted to leave the country, but was assassinated en route. General Adolfo de la Huerta assumed the interim presidency, with the election of 1920 bringing General Alvaro Obregón to the presidency. Out of a population of 15 million, the losses were high but numerical estimates vary a great deal. Perhaps 1.5 million people died; nearly 200,000 refugees fled abroad, especially to the United States. This armed conflict is often categorized as the most important sociopolitical event in Mexico and one of the greatest upheavals of the 20th century; it resulted in an important program of experimentation and reform in social organization. Foreign powers' important economic and strategic interests figured in the outcome of power struggles in Mexico, with United States involvement in the Mexican Revolution playing an especially significant role. Some scholars consider the promulgation of the Mexican Constitution of 1917 as its end point. “Economic and social conditions improved in accordance with revolutionary policies, so that the new society took shape within a framework of official revolutionary institutions,” with the constitution providing that framework. The constitution built on liberal principles of the Constitution of 1857, after which the Constitutionalist movement was named, but changes from that document recognized the importance of groups participating in the Revolution, particularly organized labor and the peasantry. Organized labor gained significant power, as seen in Article 123 of the Constitution of 1917. Land reform in Mexico was enabled by Article 27 of the Constitution. Economic nationalism was also enabled by Article 27, restricting ownership of enterprises by foreigners. Also in the Constitution were further restrictions on the Roman Catholic Church in Mexico, which, when implemented in the late 1920s, resulted in major violence in the Cristero War. No re-election of the president was enshrined in the Constitution and in practice. 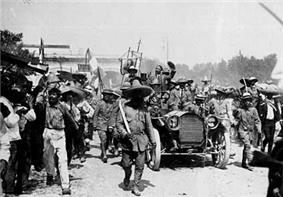 One major result of the revolution was the disappearance of the Federal Army in 1914, defeated by revolutionary forces of the various factions in the Mexican Revolution. 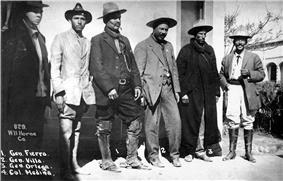 In 1915, the revolutionary army of Pancho Villa, the Division del Norte, also disappeared. Former revolutionary generals turned presidents of Mexico, Alvaro Obregón, Plutarco Elías Calles, and Lázaro Cárdenas took on the task in the 1920s and 1930s of diminishing the power and independence of those armies and asserting effective civilian control. Managing political succession was achieved in 1929 with the creation of the Partido Nacional Revolucionario (PNR), the political party that has dominated Mexico since its creation, now called the Institutional Revolutionary Party. The Porfiriato is the period in late nineteenth-century Mexican history dominated by General Porfirio Díaz, who became president of Mexico in 1876 and ruled almost continuously (with the exception of 1880-84), until his forced resignation in 1911. 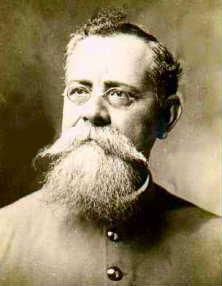 After the presidency of his ally, General Manuel González (1880-1884), Díaz ran for the presidency again and then legally remained in office until 1911. The constitution had been amended to allow presidential re-election. Díaz's re-election was ironic, since he had challenged Benito Juárez on the platform "no re-election." During the Porfiriato there were regular elections that were not democratic in nature. Although Díaz had publicly announced in an interview with journalist James Creelman that he would not run in the 1910 election, setting off a flurry of political activity, he changed his mind and decided to run again at age 80. The contested 1910 election was a key political event that led to the Mexican Revolution. As Díaz aged, the question of presidential succession became increasingly important. In 1906, the office of vice president was revived, with Díaz choosing his close ally Ramón Corral from among his Cientifico advisers to serve in the post. By the 1910 election, the Díaz regime had become highly authoritarian and opposition in many sectors of Mexican society had grown. He had been a national hero, opposing the French Intervention in the 1860s and distinguishing himself in the Battle of Puebla on May 5, 1862 ("Cinco de Mayo"). Díaz entered politics following the expulsion of the French in 1867. In the elections of 1871 that elected Benito Juárez, Díaz alleged fraud and unsuccessfully rebelled against Lerdo under the Plan de La Noria. When Juárez died in office in 1872, Sebastián Lerdo de Tejada succeeded him. Lerdo offered an amnesty, which Díaz accepted. However, when Lerdo ran for the presidency in 1876, Díaz successfully rebelled under the Plan de Tuxtepec. In his early years in the presidency Díaz was a master politician, playing factions off against one another while retaining and consolidating his own power. He used the Rurales, an armed police force directly under his control, as a paramilitary force that kept order in the countryside. He rigged elections, arguing that only he knew what was best for his country, and he enforced his belief with a strong hand. "Order and Progress" were the watchwords of his rule. Although Díaz came to power in 1876 under the banner of "no re-election," with the exception of the presidency of Manuel González from 1880–1884, Díaz remained in power continuously from 1884 until 1911, with rigged elections held at regular intervals to give the appearance of democracy. Díaz's presidency was characterized by promotion of industry and development of infrastructure by opening the country to foreign investment. He believed opposition needed to be suppressed and order maintained to reassure foreign entrepreneurs that their investments were safe. The modernization and progress in cities came at the expense of the rising working class and the peasantry. Wealth, political power, and access to education were concentrated among a handful of elite landholding families, overwhelmingly of European descent, known as hacendados, who controlled vast swaths of the country by virtue of their huge estates (for example, the Terrazas had one estate in Sonora that alone comprised more than a million acres). Most people in Mexico were landless peasants laboring on the vast estates or industrial workers toiling for little more than slave wages. Foreign companies, mostly from the United Kingdom, France, and the U.S., also exercised influence in Mexico. Anti-Diaz newspaper, Regeneración, the official publication of the Mexican Liberal Party (PLM). 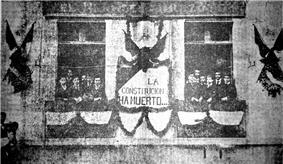 A vanner (1903) at the office of opposition magazine El hijo de Ahuizote reads: "The Constitution has died" (La Constitución ha muerto). Díaz created a formidable political machine, first working with regional strongmen and bringing them into his regime, then replacing them with jefes políticos (political bosses) who were loyal to him. He skillfully managed political conflict and reined in tendencies toward autonomy. A significant number of state governorships came to be held by military men, including General Bernardo Reyes, who became governor of the northern state of Nuevo León, but over the years military men were largely replaced by civilians loyal to Díaz. As a military man himself, and one who had intervened directly in politics to seize the presidency in 1876, Díaz was acutely aware that the Federal Army could oppose him. He augmented the rurales, a police force created by Juárez, making them his personal armed force. The rurales were only 2,500 in number, as opposed to the 30,000 in the Federal Army and another 30,000 in the Federal Auxiliaries, Irregulars, and National Guard, but despite their small numbers, the rurales were highly effective in bringing control to the countryside, especially along the 12,000 miles of railway lines. They were a mobile force, often put on trains with their horses to put down rebellions in relatively remote areas of Mexico. The construction of railways had been transformative in Mexico (as well as elsewhere in Latin America), accelerating economic activity and also increasing the power of the Mexican state. The isolation from the central government that many areas enjoyed or suffered was ending. Telegraph lines constructed next to railroad tracks meant instant communication between distant states and the capital. The political acumen and flexibility that Díaz had exhibited in the early years of the Porfiriato began to erode. State governors came under the direct control of Díaz, who could replace them at will. The Federal Army, while still large, was increasingly an ineffective force with aging leadership and troops dragooned into service. Díaz attempted the same kind of manipulation he executed with the Mexican political system with business interests, with favoritism to European interests against those of the U.S.
Rivalries particularly between U.S. interests and the British complicated a system that already had complex favoritism. As economic activity increased and gave rise to thriving industries, industrial workers began organizing. With the expansion of Mexican agriculture, landless peasants were forced to work for low wages or move to the cities. Peasant agriculture was under pressure as haciendas expanded, such as in the state of Morelos, just south of Mexico City, where sugar plantations burgeoned. There was what one scholar has called “agrarian compression,” but regions of greatest repression were not the ones that rebelled. 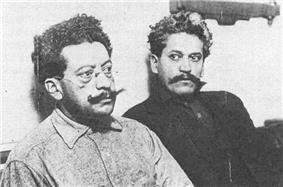 Ricardo Flores Magón (left) and Enrique Flores Magón (right), leaders of the Mexican Liberal Party in jail in the Los Angeles, California County Jail, 1917. A number of Mexicans began to organize in opposition to Díaz policies that had welcomed foreign capital and capitalists, suppressed nascent labor unions, and consistently moved against peasants as agriculture flourished. In 1905, a group of Mexican intellectuals and agitators who had created the Mexican Liberal Party (Partido Liberal de México) drew up a radical program of reform, specifically addressing what they considered to be the worse aspects of the Díaz regime. Most prominent in the PLM were Ricardo Flores Magón and his two brothers, Enrique Flores Magón and Jesús Flores Magón. They, along with Luis Cabrera Lobato and Antonio Díaz Soto y Gama, were connected to the anti-Díaz publication El Hijo de Ahuizote. 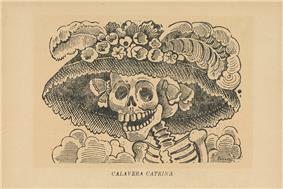 Political cartoons by José Guadalupe Posada lampooned politicians and cultural elites with mordant humor, portraying them as skeletons. 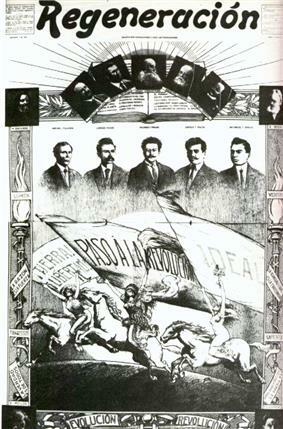 The Liberal Party of Mexico founded the anti-Díaz anarchist newspaper Regeneración, which appeared in both Spanish and English. In exile in the United States Práxedis Guerrero began publishing an anti-Díaz newspaper, Alba Roja, in San Francisco. Although leftist groups were small in number, through their publications they became highly influential and helped articulate reasons to oppose the Díaz regime. Francisco Bulnes described these men as the “true authors” of the Mexican Revolution for agitating the masses. As the 1910 election approached, Francisco I. Madero, an idealistic political novice and member of one of Mexico’s richest families, funded the newspaper Anti-Reelectionista, in opposition to the continuous re-election of Díaz. 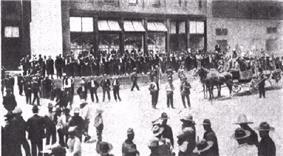 The Cananea strike, 1906, the company store guarded against workers. Labor began organizing, then striking against employers for better wages and more just treatment. Demands for better conditions for labor were part of the Liberal Party Program, drawn up in 1905. Mexican copper miners in the northern state of Sonora took action in the 1906 Cananea strike. Among other grievances, they were paid less than U.S. nationals working in the mines. In the state of Veracruz, textile workers struck in January 1907 at the huge Río Blanco factory, the world’s largest, protesting against unfair labor practices, especially the payment of wages in credit that could only be used at the company store. These strikes were ruthlessly suppressed. In the Cananea strike, mine owner William Cornell Greene received support from Díaz’s rurales in Sonora as well as Arizona Rangers called in from across the U.S. border. In the state of Veracruz, the Mexican army gunned down Rio Blanco textile workers and put the bodies on train cars that hurried to Veracruz, "where the bodies were dumped in the harbor as food for sharks". Government suppression of strikes was not unique to Mexico, with examples both in the U.S. and Western Europe. The repressive nature of the Díaz regime attracted the attention of a number of U.S. nationals, who worked in international solidarity with Mexicans opposed to Díaz, especially since U.S. businesses were directly responsible for horrific labor practices in Mexico. In particular, the leftist journalist John Kenneth Turner wrote a series of exposés of Mexico under Díaz, which he published in American magazines and then collected and published in 1910 as Barbarous Mexico. Turner posed as a rich businessman looking for good investments in Mexico and thereby gained entry into some of the most repressive and lucrative enterprises. Since the press was suppressed in Mexico under Díaz, there was little published that was critical of the regime, and little mention of the Rio Blanco textile strike, the Cananea strike, or harsh labor practices on plantations in Oaxaca and Yucatán. Leftist Mexican opponents of the Díaz regime such as Ricardo Flores Magón and Práxedis Guerrero went into exile in the relative safety of the United States, but cooperation between the U.S. government and Díaz's agents resulted in the arrest of some. Díaz had ruled continuously since 1884. The question of presidential succession was an issue as early as 1900, when Díaz turned 70. It was his "undeclared intention to step down from the presidency in 1904." Díaz seems to have considered his finance minister José Yves Limantour as his successor. Limantour was a key member of the Cientificos, the circle of technocratic Diaz advisers steeped in positivist political science. Another potential successor was General Bernardo Reyes, Diaz's Minister of War, who also served as governor of Nuevo León. Reyes, an opponent of the Cientificos, was a moderate reformer with a considerable base of support. Díaz became concerned about him as a rival, and forced his resignation from his cabinet. He then attempted to marginalize him by sending him on a "military mission" to Europe, taking him away from Mexico and potential political supporters. Díaz did re-establish the office of vice president in 1906, choosing Ramón Corral. This could have been a way to manage political succession, but was in practice a means of marginalizing Corral by distancing him from any decision-making. 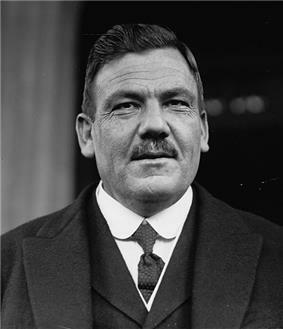 In a 1908 interview with U.S. journalist James Creelman, Diaz stated that Mexico was ready for democracy and that he would step down to allow other candidates to compete for the presidency. If Díaz kept to his statements in the interview, the presidency and vice presidency would be open in 1910. In 1909, Díaz and U.S. President William Howard Taft conducted a historic summit, held in both El Paso, Texas and Ciudad Juárez, Mexico; it was the first meeting between a U.S. and Mexican president, and the first time a sitting U.S. president crossed the border into Mexico. Díaz requested the meeting to show that he had American support for his planned eighth run as president. Taft agreed to support Diaz in order to protect the several billion dollars of American capital then invested in Mexico. At the meeting, Díaz explained, "Since I am responsible for bringing several billion dollars in foreign investments into my country, I think I should continue in my position until a competent successor is found." Díaz's reversal on retiring from the presidency set off tremendous activity among opposition groups. For Díaz, "the potential challenge from Reyes would remain one of Díaz's political obsessions through the rest of the decade, which ultimately blinded him to the danger of the challenge of Francisco Madero's anti-reelectionist campaign." In 1910 Francisco I. Madero, a young man from a wealthy land-owning family in the northern state of Coahuila, announced his intent to challenge Díaz for the presidency in the next election, under the banner of the Anti-Reelectionist Party. Madero chose as his running mate a physician who had opposed Díaz, Francisco Vázquez Gómez. Although similar overall to Díaz in his ideology, Madero hoped for other elites to rule alongside the president. Díaz thought he could control this election, as he had the previous seven; however, Madero campaigned vigorously and effectively. To ensure Madero did not win, Díaz had him thrown in jail before the election. Madero escaped and fled for a short period to San Antonio, Texas. Díaz was announced the winner of the election by a "landslide". When it became obvious that the election had been fixed, Madero supporter Toribio Ortega took up arms with a group of followers at Cuchillo Parado, Chihuahua on November 10, 1910. Principal battles during the fight to oust Díaz, November 1910-May 1911. Most action was in the northern border area, with the Battle of Ciudad Juárez being a decisive blow, but the struggle in Morelos by the Zapatistas was also extremely important, since the state was just south of the Mexican capital. On October 5, 1910, Madero issued a "letter from jail," known as the Plan de San Luis Potosí, with its main slogan Sufragio Efectivo, No re-elección ("free suffrage and no re-election"). 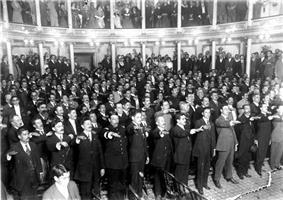 It declared the Díaz presidency illegal and called for revolt against Díaz, starting on November 20, 1910. Madero's political plan did not outline major socioeconomic revolution, but it offered the hope of change for many disadvantaged Mexicans. Madero's plan was aimed at fomenting a popular uprising against Díaz, but he also understood that the support of the United States and U.S. financiers would be of crucial importance in undermining the regime. The rich and powerful Madero family drew on its resources to make regime change possible, with Madero's brother Gustavo A. Madero hiring, in October 1910, the firm of Washington lawyer Sherburne Hopkins, the "world's best rigger of Latin American revolutions", to encourage support in the U.S. A strategy to discredit Díaz with U.S. business and the U.S. government achieved some success, with Standard Oil representatives engaging in talks with Gustavo Madero, but more importantly, the U.S. government "bent neutrality laws for the revolutionaries." 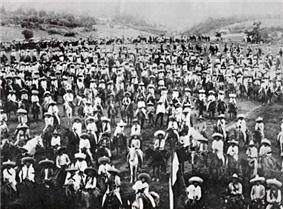 In late 1910 revolutionary movements broke out in response to Madero's Plan de San Luis Potosí. Madero's vague promises of land reform in Mexico attracted many peasants throughout Mexico. Spontaneous rebellions arose in which ordinary farm laborers, miners, and other working-class Mexicans, along with much of the country's Indian population, fought Díaz's forces, with some success. Madero attracted the forces of rebel leaders such as Pascual Orozco, Pancho Villa, Ricardo Flores Magón, Emiliano Zapata, and Venustiano Carranza. A young and able revolutionary, Orozco, along with governor Abraham González, formed a powerful military union in the north, and, although they were not especially committed to Madero, took Mexicali and Chihuahua City. These victories encouraged alliances with other revolutionary leaders, including Pancho Villa. Against Madero's wishes, Orozco and Villa fought for and won Ciudad Juárez, bordering El Paso, Texas, on the south side of the Rio Grande. Madero's call to action had some unanticipated results, such as the Magonista rebellion of 1911 in Baja California. With the Federal Army defeated in a string of battles, Diaz's government began negotiations with the revolutionaries. One of Madero's representatives to the negotiations was his running mate in the 1910 elections, Francisco Vázquez Gómez. The talks culminated in the May 21, 1911 Treaty of Ciudad Juárez. The signed treaty stated that Díaz would abdicate the presidency along with his vice president Ramón Corral by the end of May 1911, and be replaced by an interim president, Francisco León de la Barra, until elections were held. Some supporters criticized Madero for appearing weak by not simply seizing the presidency from Diaz, and for failing to pass immediate reforms; however, by following the electoral process, Madero established a liberal democracy and received support from the United States and popular leaders such as Orozco, Villa, and Zapata. Francisco León de la Barra became interim president of Mexico, pending an election to be held in October 1911. Madero won the election decisively, and was inaugurated as president in November 1911. The rebels who brought him to power were demobilized and Madero called on the men of action to return to civilian life. According to a story told by Pancho Villa, (one of those who had defeated Díaz's army and forced his resignation and exile), he told Madero at a banquet in Ciudad Juárez in 1911, "You, sir [Madero], have destroyed the revolution...It's simple: this bunch of dandies have made a fool of you, and this will eventually cost us our necks, yours included." Ignoring the warning, Madero increasingly relied on the Federal Army as armed rebellions broke out in Mexico in 1911–12, with particularly threatening insurrections led by Emiliano Zapata in Morelos and Pascual Orozco in the north. The press embraced their new-found freedom and Madero became a target of their criticism. Organized labor, which had been suppressed under Díaz, could and did stage strikes, which foreign entrepreneurs saw as threatening their interests. Although there had been labor unrest under Díaz, labor's new freedom to organize also came with anti-American currents. The anarcho-syndicalist Casa del Obrero Mundial (House of the World Worker) was founded in September 1912 by Antonio Díaz Soto y Gama, Manuel Sarabia, and Lázaro Gutiérrez de Lara and served as a center of agitation and propaganda, but was not formally a labor union. Francisco I. Madero, Emiliano Zapata, in Cuernavaca. Zapata rebelled against Madero in 1911 because of Madero's slowness to implement land reform. Political parties proliferated, one of the most important being the National Catholic Party, which in a number of regions of Mexico was particularly strong. There were several Catholic newspapers published during the Madero era, including El País and La Nación, which were suppressed later under the Victoriano Huerta regime (1913–14). Madero did not have the experience or the ideological inclination to reward men who had helped bring him to power. Some revolutionary leaders expected personal rewards, such as the young and militarily gifted Pascual Orozco of Chihuahua. Others wanted major reforms, most especially Emiliano Zapata and Andrés Molina Enríquez, who had long worked for land reform in Mexico. Madero met personally with Zapata, telling the guerrilla leader that the agrarian question needed careful study. It was clear that Madero, a member of a rich northern hacendado family, was not going to implement comprehensive agrarian reform for aggrieved peasants. In response to this lack of action, Zapata promulgated the Plan de Ayala in November 1911, declaring himself in rebellion against Madero. He renewed guerrilla warfare in the state of Morelos. Madero sent the Federal Army to deal with the Zapata, unsuccessfully. Zapata remained true to the demands of the Plan de Ayala and in rebellion against every central government up until his assassination by an agent of President Venustiano Carranza in 1919. Madero had put Orozco in charge of the large force of rurales in Chihuahua, but as a gifted revolutionary fighter who had helped bring about Díaz’s fall, Madero’s reward was insulting. After Madero refused to agree to social reforms calling for better working hours, pay, and conditions, Orozco organized his own army, the "Orozquistas", also called the Colorados ("Red Flaggers"). In early 1912 they rebelled against Madero, causing considerable dismay among U.S. businessmen and other foreign investors in the northern region. It was a signal to many that Madero’s government could not maintain the order that was the underpinning of modernization in the era of Porfirio Díaz. In April, 1912 Madero dispatched Gen. Victoriano Huerta of the Federal Army to put down Orozco's revolt. As president, Madero had kept the federal army intact as an institution, using it to put down domestic rebellions against his regime. Huerta was a professional soldier and continued to serve in the Federal Army under the new commander-in-chief, but Huerta's loyalty lay with General Bernardo Reyes, rather than the civilian Madero. In 1912, under pressure from his cabinet, Madero had called on Huerta to suppress Orozco's rebellion. With Huerta's success against Orozco, he emerged as a powerful figure for conservative forces opposing the Madero regime. During the Orozco revolt, the governor of Chihuahua mobilized the state militia to support the Federal Army, and Pancho Villa, a colonel in the militia, was called up at this time. In mid-April, at the head of 400 irregular troops, he joined the forces commanded by Huerta. Huerta, however, viewed Villa as an ambitious competitor. During a visit to Huerta's headquarters in June 1912, after an incident in which he refused to return a number of stolen horses, Villa was imprisoned on charges of insubordination and robbery and sentenced to death. Raúl Madero, the President's brother, intervened to save Villa's life. Jailed in Mexico City, Villa fled to the United States, later to return and play a major role in the civil wars of 1913-15. There were other rebellions, one by Bernardo Reyes and the other by Félix Díaz nephew of the former president, that were quickly put down and the generals jailed. They were both in a Mexico City prison, and fomented yet another rebellion February 1913. This period came to be known as the Ten Tragic Days (la decena trágica), which ended with Madero's resignation and assassination and Huerta assuming the presidency. Madero placed Huerta in charge of suppressing the Mexico City revolt as interim commander. Madero did not know that Huerta had been invited to join the conspiracy but had held back. During the fighting that took place in the capital, the civilian population was subjected to artillery exchanges, street fighting, and economic disruption. The Madero presidency was unraveling, to no one's surprise except perhaps Madero, whose support continued to deteriorate, even among his political allies. Madero's supporters in congress before the coup, the so-called Renovadores ("the renewers") criticized Madero, saying, "the revolution is heading toward collapse and is pulling down with it the government to which it gave rise, for the simple reason that is not governing with revolutionaries. Compromises and concessions to the supporters of the old [Díaz] regime are the main causes of the unsettling situation in which the government that emerged from the revolution finds itself.... The regime appears relentlessly bent on suicide." Huerta allowed the rebels to hold the armory in Mexico City, the Ciudadela, while Huerta consolidated his political power. Huerta changed allegiance from Madero to the rebels under Félix Díaz (Bernardo Reyes having been killed early in the conflict). U.S. 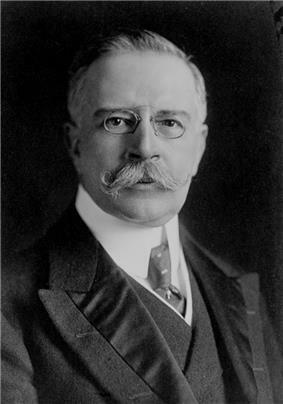 Ambassador Henry Lane Wilson, who had done all he could to undermine U.S. confidence in Madero's presidency, brokered the Pact of the Embassy, which formalized the alliance between Félix Díaz and Huerta, with the backing of the U.S. Huerta was to become provisional president of Mexico, following the resignations of Madero and his vice president, José María Pino Suárez. Rather than being sent into exile with their families, the two were murdered while being transported to prison, a shocking event, but one that did not prevent the Huerta regime's recognition by most world governments. Madero had created no continuing political organization that would survive his death and he had demobilized and alienated the revolutionary fighters who had helped bring him to power. In the aftermath of his assassination and Huerta's gaining power via military coup, former revolutionaries had no formal organization to raise opposition to Huerta. Gen. Victoriano Huerta was a Federal Army commander, who served President Francisco I. Madero (1911-13), but joined with anti-Madero conspirators in ousting him. Huerta was a counter-revolutionary, becoming president in February 1913, supported by conservative elements in Mexico and some foreign powers. 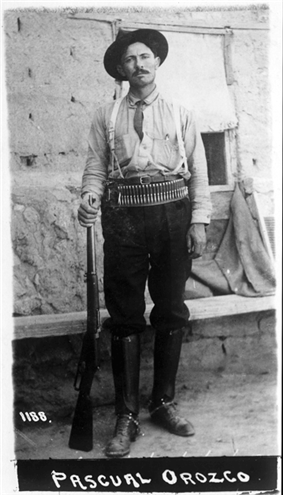 Anti-Huerta forces fought his regime, most brilliantly on the battlefield, Pancho Villa. Huerta resigned and went into exile in July 1914. Huerta's presidency is usually characterized as a dictatorship. From the point of view of revolutionaries at the time and the construction of historical memory of the Revolution, it is without any positive aspects. "Despite recent attempts to portray Victoriano Huerta as a reformer, there is little question that he was a self-serving dictator." There are few biographies of Huerta himself, but one strongly asserts that Huerta should not be labeled simply as a counter-revolutionary, arguing that his regime had two distinct periods: from the coup in February 1913 to October, in which he attempted to legitimize his regime and demonstrate its legality by pursuing reformist policies; and after October 1913, when he dropped all attempts to rule within a legal framework and murdered political opponents while battling revolutionary forces that had united against his regime. Supporting the Huerta regime initially were business interests in Mexico, both foreign and domestic; landed elites; the Roman Catholic Church; as well as the German and British governments. Huerta's first cabinet had men who had supported the February 1913 Pact of the [U.S.] Embassy, including some who had supported Madero, such as Jesús Flores Magón, supporters of Bernardo Reyes, supporters of Félix Díaz, and Catholic former interim president Francisco León de la Barra. Initially Huerta was able to recruit to his regime Andrés Molina Enríquez, author of the The Great National Problems (Los grandes problemas nacionales), a key work urging land reform in Mexico. Huerta was interested in land reform as an issue since it had such potential for continuing unrest among the peasantry. Specifically he moved to restore "ejido lands to the Yaquis and Mayos of Sonora and [advanced] proposals for distribution of government lands to small-scale farmers." When Huerta refused to move faster on land reform, Molina Enríquez disavowed the regime in June 1913, later going on to advise the constitutional convention in 1917 on land reform. Within a month of the coup, rebellion started spreading in Mexico, most prominently by the governor of the state of Coahuila, Venustiano Carranza, along with Pablo González and old revolutionaries demobilized by Madero, such as Pancho Villa. Huerta had moved swiftly upon taking power to consolidate his hold in the North. Carranza might have counted on governor of Chihuahua Abraham González, but Huerta had him arrested, for fear González would raise rebellion, and murdered. The Northern revolutionaries fought under the name of the Constitutionalist Army, with Carranza as the “First Chief” (primer jefe). When northern general Pancho Villa became governor of Chihuahua in 1914, following the ouster of Huerta, he located González’s bones and had them reburied with high honor. In Morelos, Emiliano Zapata continued his rebellion in Morelos under the Plan of Ayala (while deleting the name of counter-revolutionary Pascual Orozco from it), calling for the expropriation of land and redistribution to peasants. Huerta offered peace to Zapata, who rejected it. Lame duck President Taft, whose term ended on March 4, 1913, left the decision to recognize the new government to the incoming U.S. President Woodrow Wilson. Wilson refused to recognize Huerta's government, despite the urging of the U.S. ambassador, who had played a key role in the coup d'état. In the summer of 1913 President Wilson recalled Wilson as U.S. Ambassador and sent as his "personal representative" John Lind, a Swedish-American progressive who sympathized with the Mexican revolutionaries. Despite the lack of formal U.S. recognition of the Huerta regime, the U.S. continued to exempt his government from the arms embargo it had imposed. Wilson urged other European powers to likewise not recognize Huerta's government; he also attempted to persuade Huerta to call prompt elections "and not present himself as a candidate." The U.S. offered Mexico a loan, if Huerta accepted the proposal. Huerta refused. The envoy Lind "clearly threatened a military intervention in case the demands were not met." Governor of Coahuila Venustiano Carranza, (center), the tall and distinguished looking "First Chief" of the Constitutionalist forces in northern Mexico opposing Huerta's regime. General Álvaro Obregón (left) shown with a cigar in his left hand and his right arm missing, lost in the Battle of Celaya in 1915. In the summer of 1913, Mexican conservatives who had supported Huerta sought an elected civilian alternative to Huerta, brought together in body called National Unifying Junta. Political parties proliferated in this period, so that by the time of the October congressional elections there were 26. From Huerta's point of view, the fragmentation of the conservative political landscape strengthened his own position. For the country's conservative elite, "there was a growing disillusionment with Huerta, and disgust at his strong-arm methods." 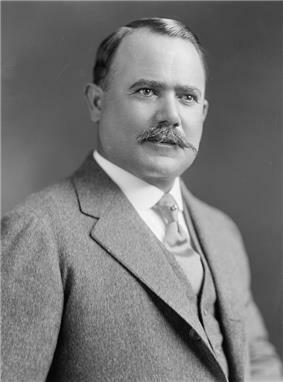 Huerta dispensed with the legislature on October 26, 1913, having the army surround its building and arresting congressmen perceived to be hostile to his regime. Congressional elections went ahead, but given that congress was dissolved and some members were in jail, the fervor of opposition candidates disappeared. The sham election "brought home to [Woodrow] Wilson's administration the fatuity of relying on elections to demonstrate genuine democracy." The October 1913 elections were the end of any pretension to constitutional rule in Mexico, with civilian political activity banned. Prominent Catholics were arrested and Catholic newspapers were suppressed. In April 1914, American opposition to Huerta culminated in the seizure and occupation of the port of Veracruz by U.S. marines and sailors. 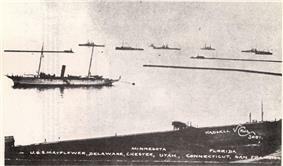 Initially intended, in part, to prevent a German merchant vessel from delivering a shipment of arms to the Huerta regime, the muddled operation evolved into a seven-month stalemate resulting in the death of 193 Mexican soldiers, 19 American servicemen, and an unknown number of civilians. The German ship landed its cargo - largely American-made rifles, in a deal brokered by American businessmen - at a different port. U.S. forces eventually left Veracruz in the hands of the Carrancistas, but with lasting damage to U.S.-Mexican relations. Huerta's position continued to deteriorate. In mid July 1914, after his army suffered several defeats, he stepped down and fled to Puerto México. Seeking to get himself and his family out of Mexico, he turned to the German government, which had generally supported his presidency; the Germans were not eager to allow him to be transported into exile on one of their ships, but relented. Huerta carried "roughly half a million marks in gold with him" as well as paper currency and checks. In exile, Huerta sought to return to Mexico via the United States and made an alliance with his former adversary, Pascual Orozco. U.S. authorities arrested him and he was imprisoned in Fort Bliss, Texas. He died in January 1916, six months after going into exile. Revolutionary fighters led by Emiliano Zapata under the Plan de Ayala, drawn up in 1911 after Madero stalled on instituting land reform in Morelos. With the departure of Huerta in July 1914, the revolutionary factions agreed to meet and make “a last ditch effort to avert more intense warfare than that which unseated Huerta.” Called to meet in Mexico City in October 1914, revolutionaries opposed to Carranza’s influence successfully moved the venue to Aguascalientes. The Convention of Aguascalientes did not, in fact, reconcile the various victorious factions in the Mexican Revolution, but was a brief pause in revolutionary violence. The break between Carranza and Villa became definitive during the Convention. Carranza had expected to be confirmed in his position as First Chief of revolutionary forces, but his supporters “lost control of the proceedings.” Opposition to Carranza was strongest in areas where there were popular and fierce demands for reform, particularly in Chihuahua, where Villa was powerful, and Morelos, where Zapata held sway. The Convention of Aguascalientes brought that opposition out in an open forum. 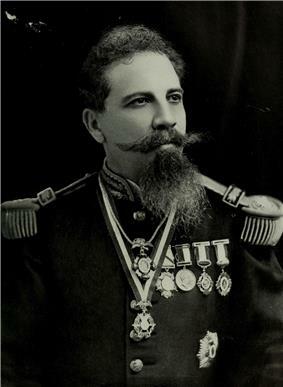 Rather than First Chief Carranza being named president of Mexico at the convention, General Eulalio Gutiérrez was chosen for a term of 20 days. The convention declared Carranza in rebellion against it. Civil war resumed, this time between revolutionary armies that had fought in a united cause to oust Huerta in 1913-1914. Although during the Convention Constitutionalist general Alvaro Obregón had attempted to be a moderate force and had been the one to convey the Convention’s call for Carranza to resign, when the convention forces declared Carranza in rebellion against it, Obregón supported Carranza rather than Villa and Zapata. Pancho Villa (left), Commander of the División del Norte (Division of the North), and Emiliano Zapata, Commander of the Ejército Libertador del Sur, joined forces in the Army of the Convention, which fought the Constitutionalist Army of Venustiano Carranza. In practice over the long term, Villa and Zapata fought in different areas and the Constitutionalists under Alvaro Obregón defeated Villa in 1915. Another advantage of Carranza’s position was the Constitutionalists' control of Veracruz, even though the United States still occupied it. The United States had concluded that both Villa and Zapata were too radical and hostile to U.S. interests and sided with the moderate Carranza in the factional fighting. The U.S. timed its exit from Veracruz, brokered at the Niagara Falls peace conference, to benefit Carranza, and allowed munitions to flow to the Constitutionalists. The U.S. granted Carranza's government diplomatic recognition in 1915. The rival armies of Villa and Obregón met in April 6–15, 1915 in the Battle of Celaya. The frontal cavalry charges of Villa’s forces were met by the shrewd, modern military tactics of Obregón. The Constitutionalists’ victory was complete. Carranza emerged in 1915 as the political leader of Mexico, with a victorious army to keep him in that position. Villa retreated north. Carranza and the Constitutionalists consolidated their position as the winning faction, with Zapata remaining a threat until his assassination in 1919. Villa also remained a threat to the Constitutionalists, complicating their relationship with the United States when he raided Columbus, New Mexico in March 1916, prompting the U.S. to send a Punitive Expedition to capture him. 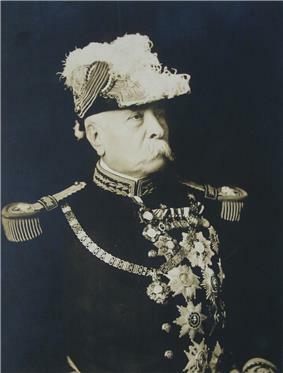 Venustiano Carranza, victorious leader of the Constitutionalist forces, who became President of Mexico. Mexico at the end of 1915, with the Constitutionalists holding the most territory. 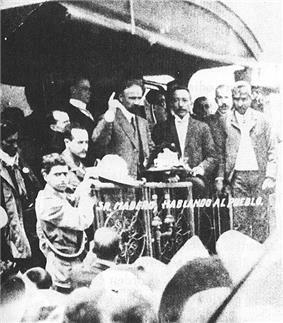 Venustiano Carranza had proclaimed the Plan of Guadalupe a month after Victoriano Huerta seized power in February 1913, uniting northern factions into a movement to oust Huerta, especially under generals Alvaro Obregón and Pancho Villa. Huerta went into exile in July 1914 and the revolutionary factions sought to decide Mexico's political future in the Convention of Aguascalientes. Villa broke with Carranza and went into alliance with Emiliano Zapata. 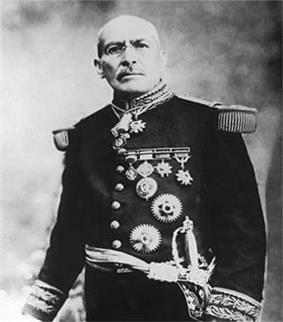 General Obregón remained loyal to Carranza, and led the Constitutionalist Army to victory over Villa in the Battle of Celaya in April 1915. The new constitution was approved on February 5, 1917. This picture shows the Constituent Congress of 1917 swearing fealty to the new Constitution. Carranza had gained recognition from the United States, which enabled arms sales to his forces. Villa had previously been friendly toward the U.S., but its recognition of Carranza, as well as Villa's decisive defeat at Celaya, finished him as a major force in Mexico. In 1916 Villa attacked Columbus, New Mexico. Under heavy pressure from public opinion (stoked mainly by the papers of ultra-conservative publisher William Randolph Hearst, who owned a large estate in Mexico) to punish the attackers, U.S. President Wilson sent Gen. John J. Pershing and around 5,000 troops into Mexico in an attempt to capture Villa. The American intervention, known as the Punitive Expedition, was limited to the western sierras of Chihuahua, and was notable as the U.S. Army's first use of airplanes in military operations. Intimately knowing the inhospitable terrain, Villa had little trouble evading his pursuers. After nearly a year the hunt was called off and Pershing's force returned to the U.S. Carranza asserted Mexican sovereignty and forced the U.S. to withdraw in 1917. With the outbreak of warfare in Europe in 1914, foreign powers with significant economic and strategic interests in Mexico - particularly the U.S., Great Britain, and Germany - made efforts to sway Mexico to their side, but Mexico in World War I maintained a policy of neutrality. In the Zimmermann Telegram, a coded cable from the German government to Carranza's government, Germany attempted to draw Mexico into war with the United States, which was itself neutral at the time. Carranza did not pursue this policy, but the leaking of the telegram pushed the U.S. into war against Germany in 1917. The 1913 Plan of Guadalupe was narrowly political, but Carranza sought to consolidate his position with support of the masses by policies of social and agrarian reform. As revolutionary violence subsided in 1916, leaders met to draw up a new constitution, thus making principles for which many of the revolutionaries had fought into law. The Roman Catholic Church in Mexico in its role in education (Article 3). The constitution was far more radical than Carranza himself. While he was elected constitutional president in 1917, he did not implement its most radical elements. He was not in a position to do so in any case, since there were still threats to his regime regionally, despite the relative subsidence of violence nationally. Emiliano Zapata was one of the leading figures in the Mexican Revolution and is now considered one of the national heroes of Mexico: towns, streets and housing developments named "Emiliano Zapata" are common across the country. His image has been used on Mexican banknotes and there is a Zapata Metro station in Mexico City. Opposed to the Porfirio Díaz regime because of the loss of peasant lands to large haciendas in Morelos, Zapata initially supported Francisco I. Madero, whose Plan de San Luis Potosí promised the return of such lands. When Madero did not implement his promise after becoming president of Mexico, Zapata rebelled against him under the Plan de Ayala. Zapata was assassinated in 1919 by an agent of the Constitutionalists, the victorious faction of the Mexican Revolution. Many peasants and indigenous Mexicans admired Zapata as a practical revolutionary whose populist battle cry, "Tierra y Libertad" (Land and Liberty), was spelled out in the Plan de Ayala for land reform. He fought for political and economic emancipation of the peasants in southern and central Mexico. Zapata was killed in 1919 by Gen. Pablo González and his aide, Col. Jesús Guajardo, in an elaborate ambush. Guajardo set up the meeting under the pretext of wanting to defect to Zapata's side. At the meeting, González's men assassinated Zapata. Since Zapata's political ambitions and campaign were usually local, women were able to aid the Zapatista soldiers from their homes. There were also female Zapatista soldiers who served from the beginning of the revolution. When Zapata met with President Madero on July 12, 1911, he was accompanied by his troops. Among them were female soldiers, including officers. Women joined the Zapatistas as soldiers for various reasons, including revenge for dead family members or to perform raids. 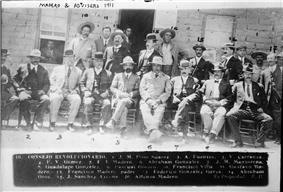 SMU's Mexic : graphs from the DeGolyer Library contains dozens of photographs related to the Mexican Revolution. Tannenbaum, Frank. "Land Reform in Mexico". Annals of the American Academy of Political and Social Science, Vol. 150, Economics of World Peace (July 1930), 238–247. Bailey, D. M. "Revisionism and the recent historiography of the Mexican Revolution." Hispanic American Historical Review 58(1)1978, 62–79. Buchenau, Jürgen. "The Arm and Body of a Revolution: Remembering Mexico's Last Caudillo, Álvaro Obregón" in Lyman L. Johnson, ed. Body Politics: Death, Dismemberment , and Memory in Latin America. Albuquerque: University of New Mexico Press 2004, pp. 179–207. Weinstock, Herbert. "Carlos Chavez." The Musical Quarterly 22:4 (Oct., 1936), 435–445. Macias, Anna. "Women and the Mexican Revolution, 1910–1920." The Americas, 37:1 (Jul., 1980), 53–82. Womack, John Jr. Zapata and the Mexican Revolution. New York: Vintage Press 1970. 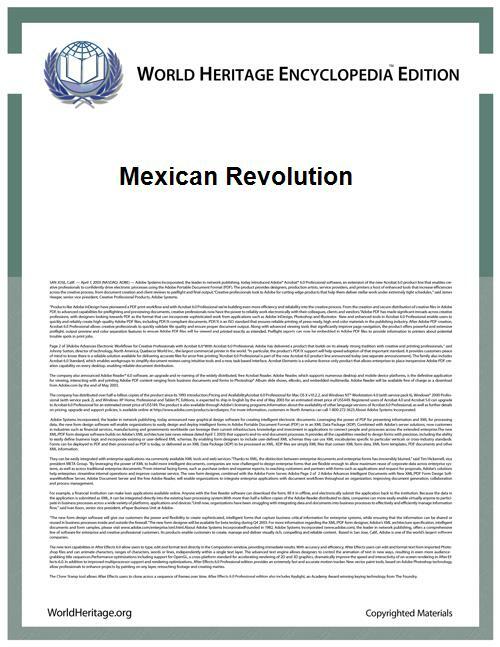 Many portions of this article are translations of excerpts from the article Revolución Mexicana in the Spanish WorldHeritage. ^ Knight,"Mexican Revolution: Interpretations" pp. 869–873. 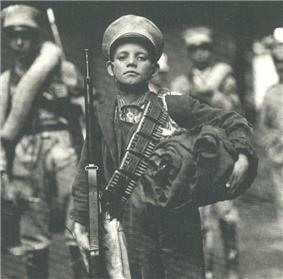 ^ Mónica Serrano, "Military, 1914–1996" in Encyclopedia of Mexico, vol. 2, p. 910-11. Chicago: Fitzroy Dearborn 1997. ^ William Weber Johnson, Heroic Mexico: The Violent emergence of a Modern Nation, Doubleday 1968, p. 69. ^ Paul Vanderwood, Disorder and Progress: Bandits, police, and Mexican development. Wilmington DL: SR Books, rev. ed. 1992. ^ John Coatsworth, Growth Against Development: The Economic Impact of Railroads in Porfirian Mexico. DeKalb: Northern Illinois University Press 1981. 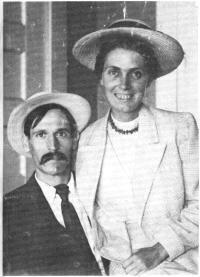 ^ Deborah J. Baldwin, Protestants and the Mexican Revolution. Urbana: University of Illinois Press 1990, p. 68. ^ Friedrich Katz, The Secret War in Mexico. Chicago: University of Chicago Press 1991. ^ Claudio Lomnitz citing Francisco Bulnes, ‘’El verdadero Díaz y la revolución’’ in Claudio Lomnitz, The Return of Ricardo Flores Magón. New York: Zone Books 2014, p. 55 and fn. 6, p. 533. ^ John Kenneth Turner, Barbarous Mexico, Austin: University of Texas Press 1969, reprint of the 1910 edition, pp. pp. 181–186. ^ Lomnitz, The Return of Ricardo Flores Magón. ^ John Kenneth Turner, Barbarous Mexico, reprinted by University of Texas Press 1969. ^ Paul Garner, Porfirio Díaz. New York: Pearson 2001, p. 209. ^ Johnson, William. Heroic Mexico p41. ^ Mark Wasserman, "Francisco Vázquez Gómez" in Encyclopedia of Mexico, vol 2, p.151. Chicago: Fitzroy Dearborn 1997. ^ Charles C. Cumberland, Mexican Revolution: The Constitutionalist Years. Austin: University of Texas Press 1972, pp. 252-53. ^ John Lear, "Casa del Obrero Mundial" in Encyclopedia of Mexico, vol. 1, pp. 206-07. Chicago: Fitzroy Dearborn 1997. ^ Alan Knight, The Mexican Revolution, vol. 1, pp. 397-404. ^ Alan Knight, The Mexican Revolution, vol. 2, p.77. ^ Douglas W. Richmond, "Victoriano Huerta" in Encyclopedia of Mexico, vol. 1, p 656. Chicago: Fitzroy Dearborn 1997. ^ Richmond, "Victoriano Huerta", p 656. ^ quoted in Katz, The Life and Times of Pancho Villa, p. 196-97. ^ Michael C. Meyer, Huerta: A Political Portrait. Lincoln: Univerity of Nebraska Press 1972. ^ Alan Knight, The Mexican Revolution, Volume 2: Counter-revolution and Reconstruction. Lincoln: University of Nebraska Press 1986, pp. 63-64. ^ Shadle, Andrés Molina Enríquez, pp. 62-63. ^ John Mason Hart, Revolutionary Mexico: The Coming and Process of the Mexican Revolution. Berkeley and Los Angeles: University of California Press 1987, p. 421, fn. 13. ^ Knight, The Mexican Revolution, vol. 2, pp. 73-73. ^ Knight, The Mexican Revolution, vol. 2, pp. 76-77. ^ Knight, The Mexican Revolution, vol. 2, pp. 77-78. ^ Christon I. Archer, ”Miliary, 1821–1914” in Encyclopedia of Mexico, vol. 2, p. 910. Chicago: Fitzroy Dearborn 1997. ^ Friedrich Katz, The Secret War in Mexico: Europe, the United States, and the Mexican Revolution. Chicago: University of Chicago Press 1981, p.258. ^ Esperanza Tuñon Pablos, “Mexican Revolution: February 1913-October 1915” in Encyclopedia of Mexico, vol. 2. P. 858. Chicago: Fitzroy Dearborn 1997. ^ Tuñon Pablos, “Mexican Revolution,” p. 858. ^ quoting from an article in El Demoócrata, November 12, 1920. Thomas Benjamin, La Revolución: Mexico's Great Revolution as Memory, Myth, and History.. Austin: University of Texas Press 2000, pp. 69, 183, fn. 7. ^ Samuel Brunk, The Posthumus Career of Emiliano Zapata. Austin: University of Texas Press 2008, pp. 67-69. ^ Jürgen Buchenau, "The Arm and Body of the Revolution: Remembering Mexico's Last Caudillo, Álvaro Obregón" in Lyman L. Johnson, ed. Body Politics: Death, Dismemberment, and Memory in Latin America. Albuquerque: University of New Mexico Press 2004, pp. 179-207. ^ Gabriela Cano, "Soldaderas and Coronelas" in Encyclopedia of Mexico, vol. 1, pp. 1357-1360. Chicago: Fitzroy Dearborn 1997. A more modern legacy is that of another insurgency from the 1990s taking on the name Zapatista, in reference to the populist revolutionary, Emiliano Zapata. The revolt began in Chiapas, which was very reliant and supportive of the revolutionary reforms, especially the ejido system, which it had pioneered before Cárdenas took power. Most revolutionary gains were reversed in the early 1990s by President Salinas, who began moving away from the agrarian socialist policies of the late post revolution period in favour of modern finance capitalism. This culminated in the removal of the ejido system in Chiapas. The destruction of what little the poor starving peasants had caused them to revolt. Calling to Mexico’s revolutionary heritage, the movement draws heavily from early revolutionary rhetoric. It is inspired by many of Zapata’s policies, including a call for decentralized local rule. The Party's name expresses the Mexican state's incorporation of the idea of revolution, and especially a continuous, nationalist, anti-imperialist, Mexican revolution, into political discourse, and its legitimization as a popular, revolutionary party. The Revolution was a powerful memory and its slogans and promises were utilized to bolster the party's power. To funnel the populace into the party, Calles and his supporters built various delegations composed of popular, agrarian, labor, and military groupings. This was an attempt to control people from all walks of life to keep political order. However, the leadership merely wished to make it appear the public was in power. In reality, most power came from a Central Executive Committee, which budgeted all government projects. This effectively turned the legislature into a rubber stamp for the PRI’s leadership. The PRI, or Institutional Revolutionary Party is one of the major lasting legacies of the Mexican Revolution; its first iteration was the Partido Nacional Revolucionario founded in 1929 under Northern revolutionary general and president of Mexico (1924-1928) Plutarco Elías Calles, following the assassination of president-elect (and former president) Álvaro Obregón in 1928. The establishment of the party created an enduring structure that managed not only presidential succession but also groups with competing interests. 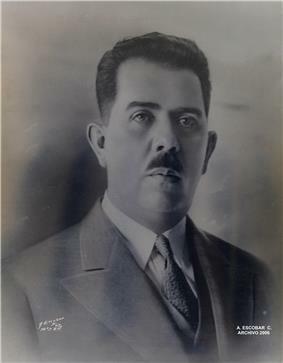 Initially, Calles remained the power behind the presidency during a period known as the Maximato, but his hand-picked presidential candidate, Lázaro Cárdenas, won a power struggle with Calles, expelling him from the country. Cárdenas reorganized the party that Calles founded, creating formal sectors for interest groups, including one for the Mexican military. The reorganized party was named Party of the Mexican Revolution. In 1946, the party again changed its name to the Institutional Revolutionary Party. The party under its various names held the presidency from 1929 to 2000 and since 2012 is the party again in power. An important element the Revolution’s legacy is the 1917 Constitution. It was pushed forward by populist generals within Carranza’s government to gain popular support. It was not written by liberal elites or the military itself, but rather young populist professionals, giving the document some authenticity for the peasantry. The document brought numerous reforms demanded by populist factions of the revolution, with article 27 empowering the state to expropriate resources deemed vital to the nation. These included expropriation of hacienda lands and redistribution to peasants. Article 27 also empowered the government to expropriate holdings of foreign companies, most prominently seen in the 1938 expropriation of oil. In Article 123 the constitution codified major labor reforms, including an 8-hour work day, a right to strike, equal pay laws for women, and an end to exploitative practices such as child labor and company stores. The constitution restrictions on the Roman Catholic Church in Mexico. In the early 1990s, the government introduced reforms to the constitution that rolled back the government's power to expropriate property and its restrictions on religious institutions. Just as the government of Carlos Salinas de Gortari was amending significant provisions of the constitution, Metro Constitución de 1917 station was opened. The popular heroes of the Mexican Revolution are the two radicals who lost: Emiliano Zapata and Pancho Villa. Dynamic equestrian statues of popular revolutionaries Zapata and Villa were erected in their respective strongholds. Zapata's name was appropriated by the rebels of Chiapas, the Zapatista Army of National Liberation (EZLN) while those who took and held power have a far more muted historical remembrance. Venustiano Carranza led the victorious Constitutionalist faction, but his attempt to impose a civilian presidential successor unacceptable to northern revolutionary generals prompted Carranza's flight from Mexico City in 1920 and then murder. Carranza is now buried in the Monument to the Revolution and there is a museum in his honor. In that museum, " are the bullets taken from the body of Francisco I. Madero after his murder. Carranza had kept them in his home, perhaps because they were a symbol of a fate and a passive denouement he had always hoped to avoid." Revolutionary general Plutarco Elías Calles founded the single-most political party in Mexico's twentieth century, but his attempt to continue his control to the presidency of Lázaro Cárdenas resulted in Cárdenas expelling him from Mexico. Neither Carranza nor Calles has much of note named for them in Mexico, although both are significant figures in the country's history. 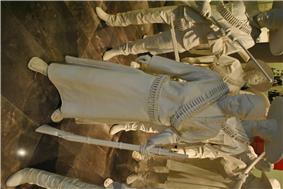 Adelita in the Historical Museum of the Mexican Revolution. In Mexico City, there are colonias (boroughs) named for Alvaro Obregón, Venustiano Carranza, and Gustavo A. Madero, brother of murdered president Francisco I. Madero. There is a portion of the old colonial street Calle de los Plateros leading to the main square zócalo of the capital named Francisco I. Madero. The Mexico City Metro has stations commemorating aspects of the Revolution and the revolutionary era. When it opened in 1969 with line 1 (the "Pink Line"), two stations alluded to the Revolution. Most directly referencing the Revolution was Metro Pino Suárez, named after Francisco I. Madero's vice president, who was murdered with him in February 1913. The other was Metro Balderas, whose icon is a cannon, alluding to the Ciudadela armory where the coup against Madero was launched. In 1970, Metro Revolución opened, with the station at the Monument to the Revolution. As the Metro expanded, further stations with names from the revolutionary era opened. In 1980, two popular heroes of the Revolution were honored, with Metro Zapata explicitly commemorating the peasant revolutionary from Morelos. 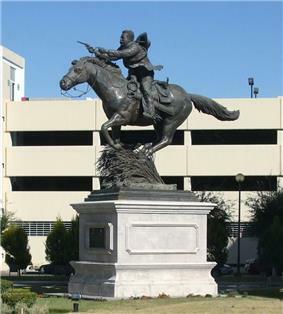 A sideways commemoration was Metro División del Norte, named after the Army that Pancho Villa commanded until its demise in the Battle of Celaya in 1915. The year 1997 saw the opening of the Metro Lázaro Cárdenas station. In 1988, Metro Aquiles Serdán honors the first martyr of the Revolution Aquiles Serdán. In 1994, Metro Constitución de 1917 opened, as did Metro Garibaldi, named after the grandson of Italian fighter for independence, Giuseppi Garibaldi. The grandson had been a participant in the Mexican Revolution. In 1999, the radical anarchist Ricardo Flores Magón was honored with the Metro Ricardo Flores Magón station. Also opening in 1999 was Metro Romero Rubio, named after the leader of Porfirio Díaz's Cientificos, whose daughter Carmen Romero Rubio became Díaz's second wife. In 2012, a new Metro line opened with a Metro Hospital 20 de Noviembre stop, a hospital named after the date that Francisco I. Madero in his 1910 Plan de San Luis Potosí called for rebellion against Díaz. There is no Metro stop named for Madero, or for Carranza, Obregón, or Calles, and only an oblique reference to Villa in Metro División del Norte. Emiliano Zapata is buried in Cuautla, Morelos, near where he was assassinated in 1919. Since 1921 yearly ceremonies commemorate his assassination at his grave. In 1923, as president of Mexico, Álvaro Obregón sent an envoy to the ceremony in Cuautla and paid the expenses of other officials from the capital to attend. Other reforms included nationalization of key industries such as petroleum, land, and the railroads. To appease workers, Cárdenas furthered provisions to end debt peonage and company stores, which were largely eliminated under his rule, except in the most backwater areas of Mexico. To prevent conservative factions in the military from plotting and to put idle soldiers to work, Cárdenas mobilized the military to build public works projects. That same year another Cristero revolt occurred. This was partially caused by Cárdena’s mandate for secular education early in his presidency in 1934. The revolt was quickly put down due to lack of official support from the Catholic Church, who told rebels to surrender themselves to the government. His first acts of reform in 1935 were aimed towards peasants. Former strongmen within the land owning community were losing political power, so he began to side with the peasants more and more. He also tried to further centralize the government’s power by removing regional caciques, allowing him to push reforms easier. To fill the political vacuum, Cárdenas helped the formation of PNR sponsored peasant leagues, empowering both peasants and the government. After the war ended in 1929, supporters of Calles and Obregón began to form a united political party called the National Revolutionary Party or PNR. This was to unite the various revolutionary factions of the civil war to prevent further Cristero revolts and build stability. Meanwhile, in 1927 another military coup was attempted, this time receiving support from land owners. Calles quickly crushed the rebellion with help from the newly mobilized peasant battalions, who later on were used to fight against the Church. In the midst of the mobilized worker’s militias, land reform, and anti-church actions, the American government began to openly declare Mexico a Bolshevik regime. To recover from the backlash, Calles began to tone down the radical rhetoric and slowed land reform policies in 1928. A year later, Calles defeated the church ending the rebellion. Shortly after the failed coup, Obregón’s term ended and Sonoran revolutionary Plutarco Elías Calles took power. In an attempt to buffer his regime against further coups, Calles began arming peasants and factory workers with surplus weapons. He continued other reforms pushed by his predecessor, such as land reform and anti-clerical laws to prevent the Catholic Church from influencing the state. With regard to the masses, Obregón, who was conservative but still a reformer, started listening to demands to appease the populace. Obregón’s first focus, in 1920, was land reform. He had governors in various states push forward the reforms promised in the 1917 constitution. These were, however, quite limited. Former Zapatistas still had strong influence in the post-revolutionary government, so most of the reforms began in Morelos, the birthplace of the Zapatista movement. Revolutionary General and President of Mexico Alvaro Obregón served his entire elected term 1920–1924;he ran for re-election in 1928, but was assassinated before he could take office, causing a crisis in managing presidential succession. One of the major issues that faced Alvaro Obregón’s early post-revolution government was stabilizing Mexico. Regional caciques (chiefs) were still fighting each other in small skirmishes. The populace was demanding reforms, promised by the 1917 constitution. Many issues faced the working poor, such as debt peonage and company stores that kept the populace poor. The military had generals who wanted to overthrow the regime and take power for themselves. There were also foreign governments, primarily the United States, who feared Mexico would take a communist turn such as Russia was to do in 1918. Obregón was in a difficult position; he had to appeal to both the left and the right to ensure Mexico would not fall back into civil war. Later that year, Carranza assembled the constitutional convention drafting the new constitution. With this, Carranza also gained support of the communists and anarchists, who were formed into Red Battalions to confront the forces of Villa and those remaining of Zapata’s. This further turned the tide, causing Villa to surrender in 1920. 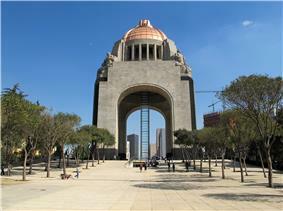 He negotiated a peace deal with Carranza, ending all hostilities and granting him a small estate, thus ending the war. As the war went on in 1919, Zapata began to run out of essential supplies, such as ammunition, and decided to acquire them from Guajardo. Zapata went to Guajardo's camp to negotiate with the colonel, whom he had not met before. However, Zapata had walked into a trap. Guajardo’s soldiers attacked Zapata, killing him and routing his forces. Venustiano Carranza rewarded Guajardo with a promotion to general and a cash prize of 100,000 pesos for having "successfully completed the difficult commission that was conferred to him." Zapata was low on supplies and his lines were moving further south. However, a colonel named Jesús Guajardo from the Federal Army approached him, offering to join with Zapata’s forces. Zapata had misgivings, as previous defectors and former Federal Army generals had betrayed him before. To test Guajardo's loyalty, Zapata had him attack one of Carranza’s strongholds, which he carried out successfully. In 1916, the revolution was drawing to a close. Carranza was gaining support from peasants with the promise of a new constitution. This caused Emiliano Zapata’s forces to lose some support, pushing their forces further south. Later that year, Carranza also sent General Gonzales after Zapata, causing further troubles for his Liberation Army of the South. In 1917, the situation was growing worse for Zapata. During the counter-revolutionary regime of Huerta (1913-1914), the Catholic Church initially supported him. "The Church represented a force for reaction, especially in the countryside." However, when Huerta cracked down on political parties and conservative opposition to Huerta. Huerta had "Gabriel Somellera, president of the [National] Catholic Party arrested; La Nación, which like other Catholic papers had protested Congress's dissolution and the rigged elections [of October 1913], locked horns with the official press and was finally closed down. El País, the main Catholic newspaper, survived for a time." During Francisco I. Madero's presidency (1911-1913), Church-state conflict was channeled peacefully. The National Catholic Party became an important political opposition force during the Madero presidency. In June 1912 congressional elections, "militarily quiescent states...the Catholic Party (PCN) did conspicuously well." During that period, the Catholic Association of Mexican Youth(ACJM) was founded. Although the National Catholic Party was an opposition party to the Madero regime, "Madero clearly welcomed the emergence of a kind of two party system (Catholic and liberal); he encouraged Catholic political involvement, echoing the exhortations of the episcopate." What was emerging during the Madero regime was "Díaz's old policy of Church-state detente was being continued, perhaps more rapidly and on surer foundations." The Catholic Church was working within the new democratic system promoted by Madero, but it had its own interests to promote, some of which were the forces of the old conservative Church, while the new, progressive Church supporting social Catholicism of the 1891 papal encyclical Rerum Novarum was also a current. When Madero was overthrown in February 1913 by counter-revolutionaries, the conservative wing of the Church supported the coup. From 1876–1911 relations between the Roman Catholic Church and the Mexican government were stable, with the anticlerical laws of the Mexican Constitution of 1857 remaining in place, but not enforced, so conflict was muted. The first time the United States intervened with this revolution was in 1914, during the Ypiranga incident. When United States intelligence agents received word that the Ypiranga, a German merchant ship, contained illegal firepower for Huerta, President Wilson ordered American troops to the port of Veracruz to stop the ship from docking. Wilson never actually declared war on Mexico. The United States skirmished with Huerta's troops in Veracruz. The Ypiranga did dock at another port and unload the arms, which greatly angered Wilson. The ABC Powers arbitrated and U.S. troops left Mexican soil, but the incident added to already tense Mexican-American relations. In 1916, in retaliation for Pancho Villa's plunder on Columbus, New Mexico, and the death of 16 United States citizens who were killed when a group of Villistas attacked a train on the Mexico North Western Railway, near Santa Isabel, Chihuahua, President Wilson sent forces commanded by Brig. Gen. John J. Pershing into Mexico to capture Villa. Villa was deeply entrenched in the mountains of northern Mexico, and knew the terrain too well to be captured. Pershing could not continue with his mission and was forced to turn back. This event not only damaged the fragile United States-Mexico relationship, but also gave way to a rise in anti-American sentiment among the Mexicans. American forces at Veracruz, 1914.